Can Blu-ray Players Play DVD? If you’ve been buying Blu-ray discs, you should notice that manufacturers are still making and selling DVDs. Blu-ray, as the better option to replace DVD, is now much more popular than DVD. But a lot of people would still have some DVDs in their household. When you buy a Blu-ray player for playback of your Blu-ray discs, does that mean you’ll have to give up on the DVDs? Not necessarily. Actually, most, if not all, Blu-ray players can play DVDs and even CDs and this support for DVD/CDs of Blu-ray players are expected to continue in the future. Can you play DVD on Blu-ray players? The answer is yes. In fact, most Blu-ray players can not only play DVDs, they can even upscale the DVD signal to play on TVs of higher resolutions like 720p/1080i/1080p or even 4K. Or if you prefer, you can stick to the standard DVD resolution for playback. While most Blu-ray players can play DVDs, there are exceptions. The simplest way to find out if the Blu-ray player you have can play DVDs is to check the official website of the Blu-ray player or its user guide and see if the DVD is listed as a supported disc format. Do Blu-ray players play DVD? Yes, they do. But while Blu-ray players are downward compatible with DVD discs, there’s no way for a DVD player to play a Blu-ray disc. If you just made the switch from DVD discs to Blu-ray, a Blu-ray player is needed to play the Blu-ray discs. Can a Blu-ray Player play DVD? Yes, it can. But a DVD player can’t play Blu-ray discs. If the DVD player is all you got, you should consider upgrading it to a Blu-ray player. Or if you have a blank DVD disc, you can try converting Blu-ray to DVD to play on your DVD player. The process is fairly easy. All you need is a DVD burner, a computer and Blu-ray to DVD converter software. 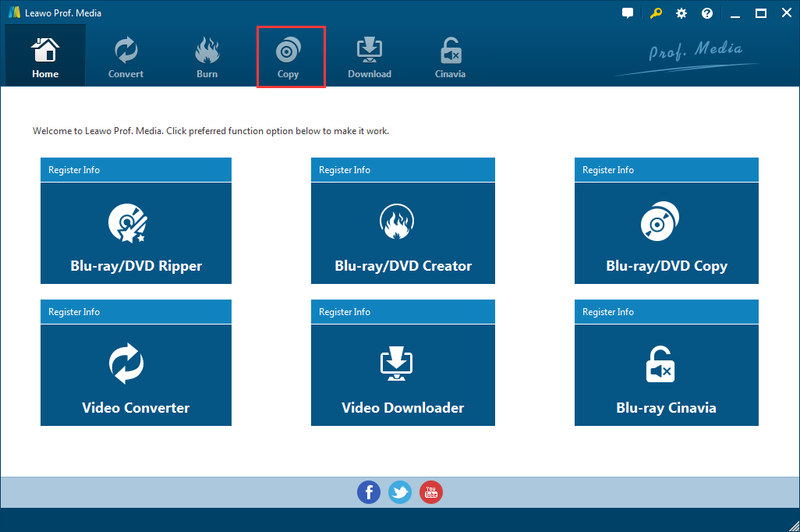 If you’ve got your computer and the DVD burner ready, try using Leawo Blu-ray Copy to help you convert Blu-ray to DVD. The program is powerful and very suitable for Blu-ray to DVD conversion. It can copy Blu-ray to DVD discs directly provided that you have a Blu-ray drive and a Blu-ray/DVD burner. If there’s only one Blu-ray drive available, you can try converting Blu-ray to a DVD folder or an ISO image on your hard drive and later use Leawo Blu-ray Copy again to burn the DVD folder or the ISO image to a DVD disc. For a detailed guide on how to convert Blu-ray to DVD, check out the content below. After installing Leawo Blu-ray Copy on your computer, you will have to find the program inside a software suite called Prof.Media. Step 1. 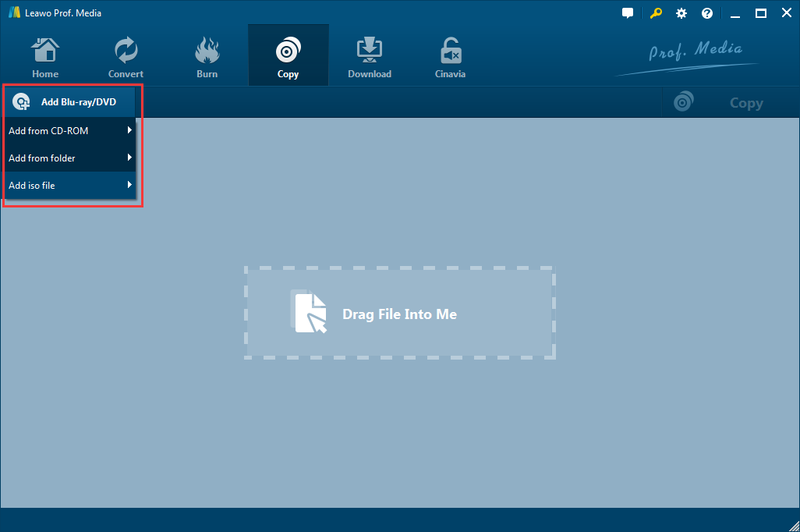 Double click the Prof.Media icon on your desktop to launch the program and hit the Blu-ray Copy tab when you see it on Prof.Media’s interface to open Blu-ray Copy. Step 2. Have the Blu-ray disc inserted in your Blu-ray drive before or after Step 1. As long as the disc is ready, you can start to import the data in the disc to the program by clicking the Add Blu-ray/DVD button in the upper-left. On the drop-down menu that follows, click Add from CD-ROM and there will be another menu with the name of your disc. Click this option to load the data of the disc to the program. Another way to import the source files from the disc is to drag the Blu-ray folder to the program’s main interface. Step 3. You will see a sidebar on the right with the video titles, audio tracks and subtitles listed on it and a video player window on the right. You can preview/watch the videos with the video player. 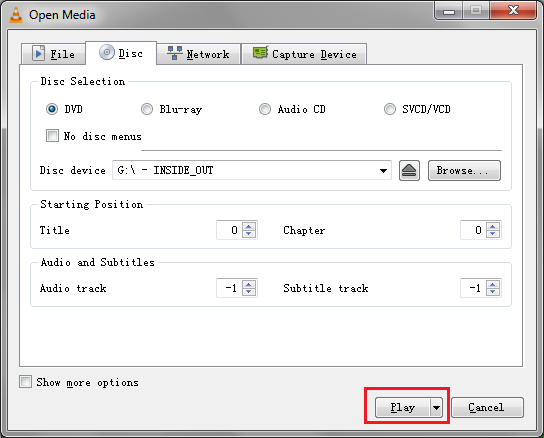 You have 3 options for choosing different videos in the disc to include in the DVD copy. To directly include all the content in the copy, choose Full Movie. The Main Movie mode is for when you only need the main movie. If you choose Custom Mode, then you can select the videos, subtitles and audio tracks you need manually on the respective lists. After that, find the disc format option in the bottom left-hand corner and click on it to select a disc format for the copy from the drop-down menu. You should select a format according to the format of the blank disc you are using. Step 4. Hit the Copy button above the video player. On the sidebar that appears later, pay attention to the 3 options on top of it. If you have a spare DVD burner available for DVD burning, you can put the blank disc in it, check the third option and select the blank disc as the destination from the drop-down menu of the third option. If you only have one drive, save the output DVD files to your hard drive first by checking either ISO file or DVD folder option or both. And then you need to select a folder on your hard drive to store the output files in the Save to box. Afterwards, click the Copy button at the bottom area to start converting Blu-ray to DVD. 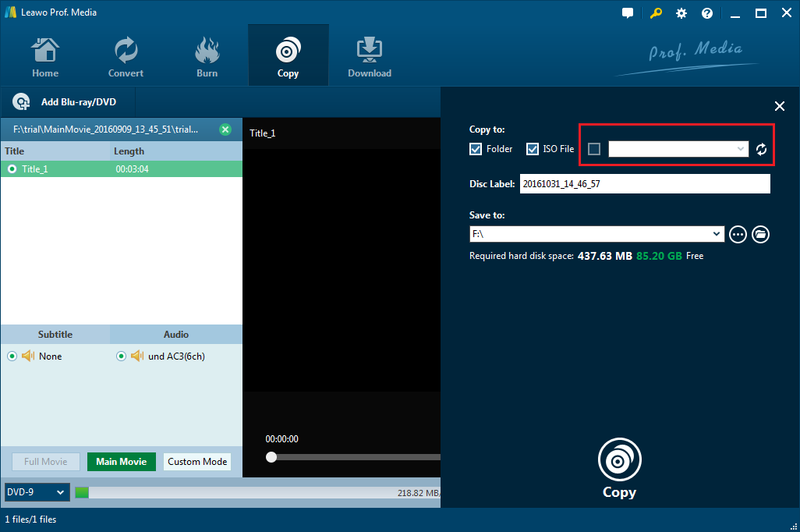 If you only have one disc drive available, here’s how to use it and Leawo Blu-ray Copy to burn the DVD files you get from the above steps to a DVD disc. Step 1. Get the Blu-ray disc out of your Blu-ray drive and put the blank disc in it. Make sure the Blu-ray drive you use is capable of burning discs. Step 2. Close Prof.Media and launch the program again, and then click the Blu-ray Copy icon to load it. Step 3. Click Add Blu-ray/DVD, and this time, choose Add ISO file or Add from Folder according to the form of DVD file you’ve chosen to convert the Blu-ray disc into and then import the source DVD files to the program. Step 4. Since the videos and other content you need have been included in the DVD files, there’s no need to select them again. So you can directly choose Full Movie here and click the disc format menu to select a disc format the same as the format of the blank disc in your disc drive. Step 5. Click the green Copy button and check the third option on the top and hit the Copy button to start burning the DVD files to the DVD disc. Afterwards, you will have a DVD disc to play on your DVD player. For your information, most Blu-ray players are also capable of playing this kind of homemade DVD disc so even when you decide to get a Blu-ray player later, the copy you made should still be playable. Microsoft had stop giving users the ability to play Blu-ray/DVD discs on its operating system directly since Windows 8. If you want to play a Blu-ray/DVD disc on Windows 8/8.1/10, you are going to need third-party Blu-ray/DVD player software. Microsoft does offer a Blu-ray/DVD player but it’s not free. If you wish to watch a Blu-ray/DVD movie on your computer without having to pay for it, you might not want to count on Microsoft. But you do have a few excellent free Blu-ray/DVD players to choose from to play physical media on your computer for free. 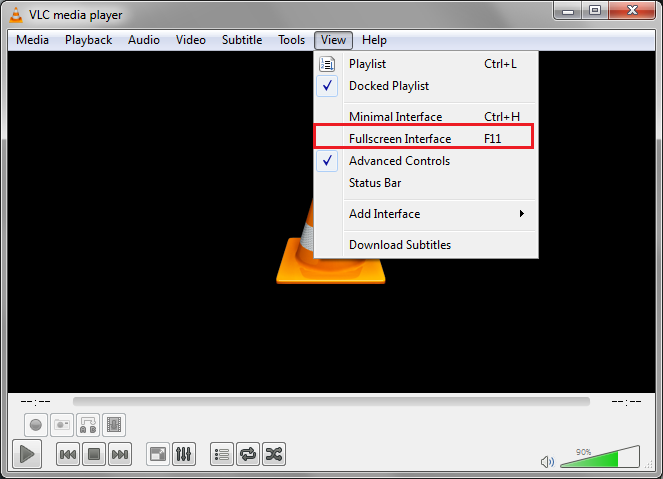 To play a DVD disc, you can try using VLC Media Player. 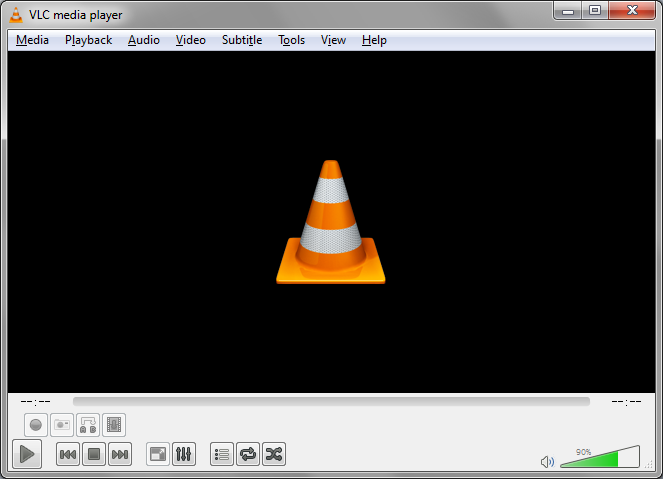 VLC Media Player is an open-source, cross-platform multimedia player that supports a wide variety of media files. And with the help of specific codecs it can play even more files. 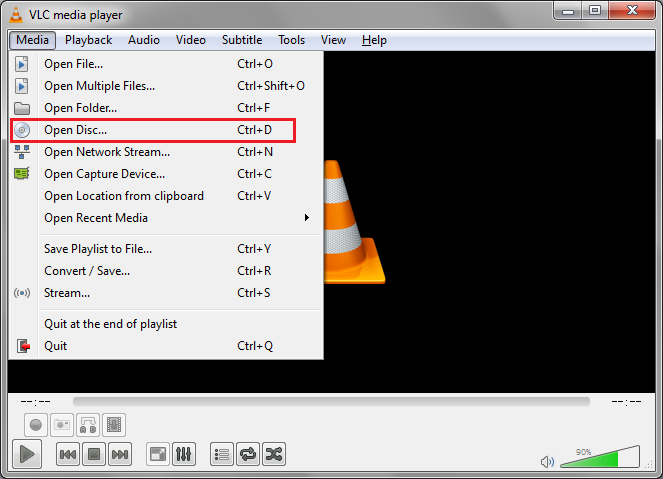 VLC can play Blu-ray, DVD, CD and VCD discs. But here we are introducing it as a DVD player because it can play DVDs directly with no extra codecs needed. But if you want to play Blu-rays with VLC, then you are going to need specific codecs for decrypting the Blu-ray protections and that’s a lot of work to do for computer novice. Another reason why it’s not recommended to play Blu-ray with VLC is that there’s a better option for that, which we will talk about later. But VLC is sufficient for playing DVDs on your computer. 1. Insert the DVD disc in your disc drive and then fire up VLC Media Player on your computer. 2. The first thing to do after launch VLC isn’t opening the disc but to set the viewing mode. Click View from the menu bar and then choose Fullscreen Interface. 3. To open the DVD disc, click Media from the menu bar and then choose Open Disc from the drop-down menu. 4. There will be a dialog box with several playback options for physical media like choosing an audio track or subtitles before the playback begins. To start playing the DVD disc, click the Play button at the bottom. 5. After the playback starts, you can use the playback controls in the bottom-left corner of the player window to control the playback if you need. That’s how you can play a DVD with VLC on your computer. As is mentioned previously, there’s another program that’s better than VLC in playing Blu-rays. Check out what the program is in the next part. To play a Blu-ray disc, there’s a program called Leawo Blu-ray Player you can use. As you can see from the name of the program, it comes from the same company as Leawo Blu-ray Copy that we used above for converting Blu-ray to DVD. 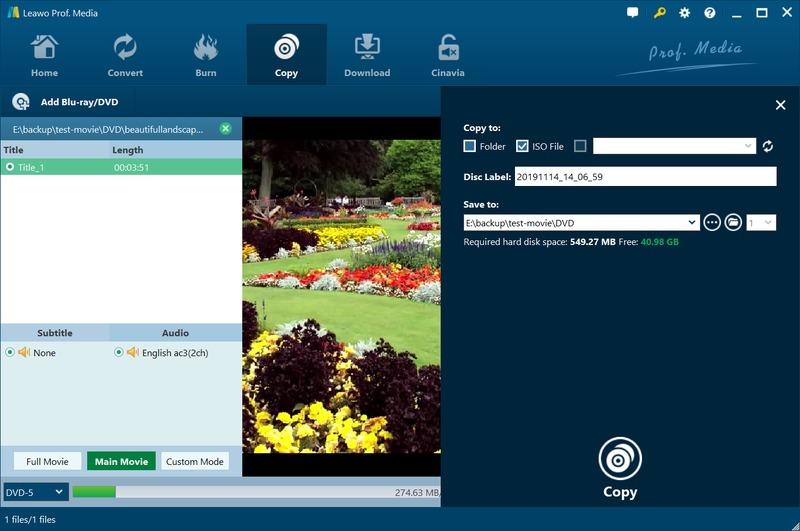 Unlike most Blu-ray player software out there, Leawo Blu-ray Player is completely free. You don’t have to pay a penny for it to use it to play Blu-ray on your computer. And it has the codec for decrypting commercial Blu-ray discs built-in which allows you to play a Blu-ray disc with it directly without having to look for specific codecs. It’s easy to play a Blu-ray disc using Leawo Blu-ray Player. Make sure that the disc drive you have can play Blu-ray discs. Enter the Blu-ray disc inside your disc drive and if you’ve opened Leawo Blu-ray Player before, there would be a pop-up window that has the option for you to directly play the Blu-ray disc with Leawo Blu-ray Player, just click on that option to play Blu-ray with Leawo Blu-ray Player. 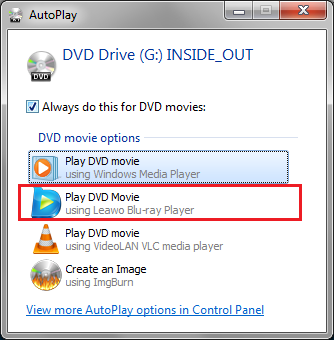 If you can’t see the option for playing the disc with Leawo Blu-ray Player, just open Leawo Blu-ray Player after inserting the Blu-ray disc into your Blu-ray drive, and then there will be a button on the window that allows you to directly load the Blu-ray disc to the program and play it. That’s how to play a Blu-ray disc on your computer. If you want to watch a Blu-ray movie on your computer, Leawo Blu-ray Player would be a great program for you.